Want to learn logo design online? There’s certainly no shortage of logo design and branding courses, classes, training videos or tutorials online, making it difficult to choose what’s right for you. To help this process, I’ve compiled the best logo courses online based on my experience as a brand designer and by asking other experts in the field. When choosing your course, take into consideration the value, cost, length and content of each course, and the fact that some options are subscriptions, meaning you will get access to multiple courses and instructors. These are the top free and paid logo courses online, with their cost and time required to complete the course/video. 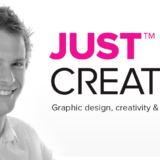 See here for the best free graphic design courses. The LogoCore Masterclass is the most in-depth online logo course available, perfect for beginners and intermediate designers looking to learn logo design. Master Adobe Illustrator, learn grid structures, how to vectorize a logo, how to present design work, create a styleguide, build a creative brief, get valuable feedback, animate logos and so much more. They also have a mentorship program. Get an exclusive 10% discount with coupon code ‘JUST10’. Simply enter the coupon at checkout. The best part? You get 65% off Adobe Creative Cloud. 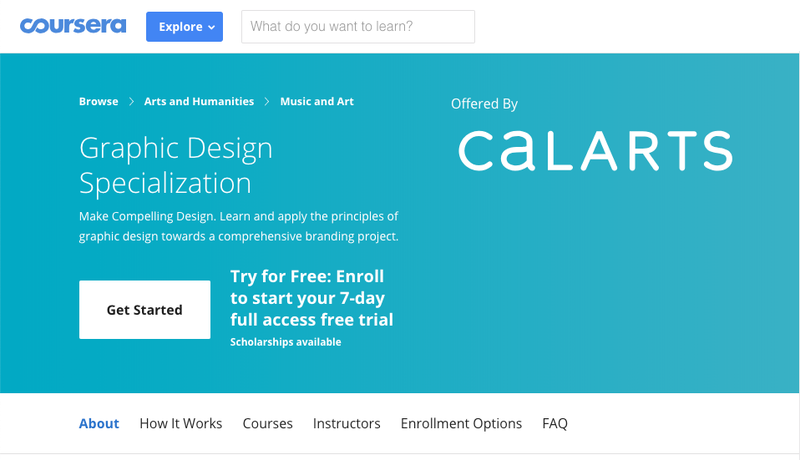 If you’re wanting to a deeper dive into design fundamentals, typography, branding and logo design you should enroll in Coursera’s Graphic Design Specialization Course in association with California Institute of the Arts. 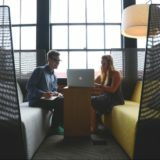 The course goes over six months and costs $49 a month, and has a closing course ‘Brand a New Brand’ which puts all your new skills into practice. The Logo Design Masterclass on Udemy uses a hands-on approach to learning Adobe Illustrator and logo design as a whole. This course contains 13 sections and 85 lectures, so it’s packed with value! There are two great teachers on LinkedIn Learning that I recommend you check out; Von Glitschka and Bill Gardner, both heavy-weights in the design industry. Von’s 2.5hr class ‘Learning Logo Design‘ is packed full of juicy tips, not just for creating logos but the actual business of design; determining scope, quoting, naming, crafting identities and brand systems, pitching your work, styleguides and much more. He also has 6 other classes available. Currently, Bill has 10+ tutorials on logo design, but I recommended to start on his ‘Logo Development‘ series which goes into the fundamentals of logo design. Bill actually goes into the of value of preparation and research before getting into the creative side of things, discovering the motivations behind a client’s decision to rebrand as well as competitor analysis. A higher level look at the logo design process. For a quick dip into logo design, Skillshare offer short classes on logo design. Although these classes are a great way to wet your toes, they don’t offer a holistic solution to learning brand design, but they are perfect for learning & refining particular skills. For an energy-packed class, be sure to watch Aaron Draplin’s logo design tutorials. CreativeLive offer a number of logo design & branding tutorials from a variety of different teachers. Like Skillshare, these vary in scope and quality and are shorter in length. If you’re a business owner (non-designer) and are looking to learn the basics for your own “DIY logo”, check out this class on logo design for your small business. This Logo Design & Construction course from The Futur, teaches you the creative process of logo design and “best practices from design professionals who charge $10k+”. There are 6 modules that explore the different types of logo design; letter marks, monoline logos, word mark logos, symbols, combination marks and crests. The Futur also have a number of free logo design videos on YouTube. Want to know how to learn logo design for free? Here are the best free course to learn logo design online. In Professional Logo Design in Adobe Illustrator, created by Rawson Uddin, students are given access to over seven hours of on-demand video courses, as well as full lifetime access and receive a certificate of completion at the end of the course. The only recommended requirement is to have a basic knowledge of Adobe Illustrator as the course is an advanced lesson. Along with the course, you can download a working file to practice with as you go through the course. All in all, the Professional Logo Design in Adobe Illustrator provides a robust class for those looking to start designing logos. See here for more top free logo design courses. Choosing to take an online course to learn logo design or the business of design is a very honorable thing to do. Like you, I understand that time, money and many other factors can keep you from picking one course to take over another. I hope that the courses showcased here can give you some idea of some of the best paid & free logo design courses available online today. Here are the best courses summarised again. 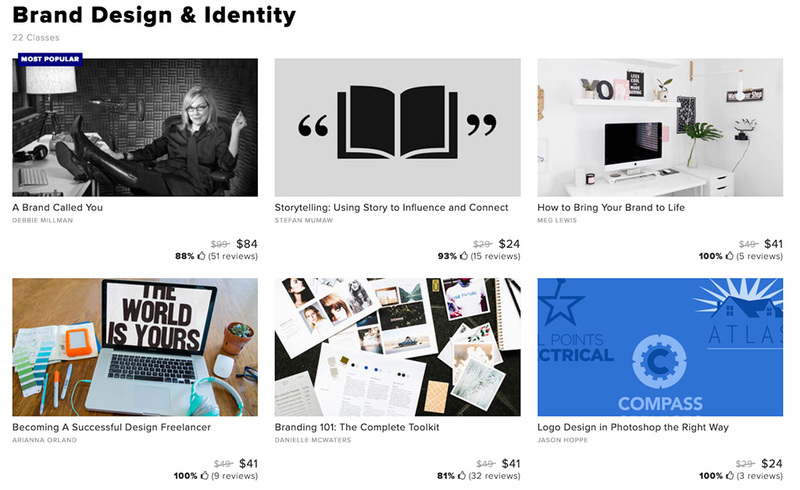 Have you taken an online branding course? Let us know more about it in the comments.